Today we are staying home and hanging out as a family. Burgers (bbq'd by Nate, of course), chips (both potato and Doritos), Coke, watermelon, strawberries, pasta salad, corn on the cob. Now it's apple pie and ice cream that Brit and I made together just an hour ago. We watched Joey Chestnut once again take the Nathan's Famous Hot Dog Eating Championship. We played Lee Greenwood's American Patriot album through twice, and then moved on to our country fav's. Tonight we'll watch fireworks from the New Life parking lot. Which is the best way to celebrate the 4th of July that I can think of. so that our nation remains great. For those who stayed awake last night keeping watch so we didn't have to worry about our freedom this morning. 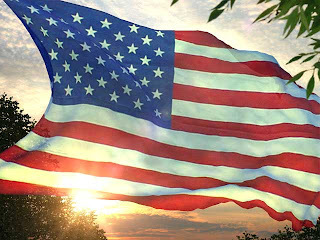 We thank God for the blessings and the freedoms that the United States of America has. And we pray for the continued turning of our country to Him.